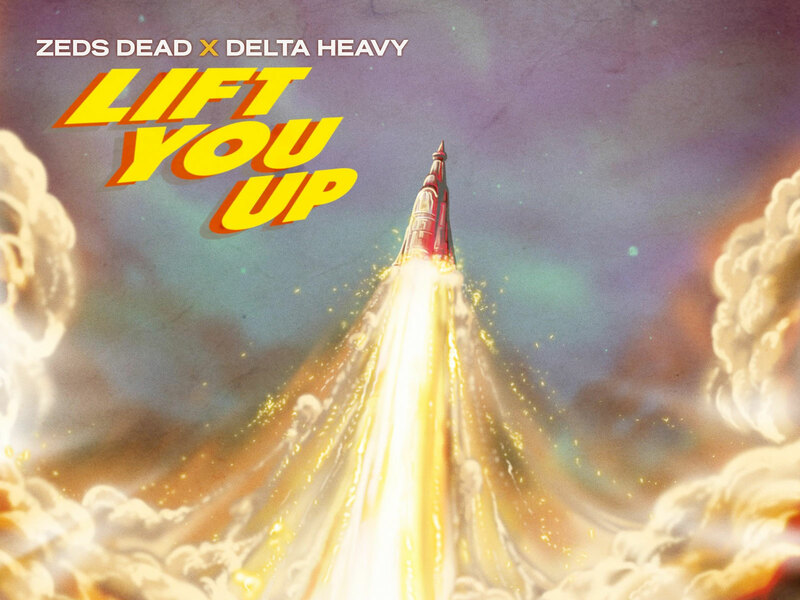 Kicking off 2019 with a statement of musical intent, Canadian heavyweights Zeds Dead and UK bass lords Delta Heavy join forces with for their mammoth new collaboration, the rumbling, dirty but delicate ‘Lift You Up’, out worldwide January 18th on Ram Records and Deadbeats. A relentless roller from start to finish, ‘Lift You Up’ is peak time dance floor anthem at its finest. Combining depth defying drops, fluttering vocal samples and flawless switches in energy levels wrapped up in layer upon layer of honed melodic percussion, the quartet allows the cut to keep one foot soaked in the world of DnB, the other steeped in Stateside-style dub and bass. Having been first debuted at Zeds Deads & Deadbeats sold out annual 2 night stand at Red Rocks this past summer, the hotly anticipated release of this track has been a topic of discussion amongst fanbases for months now as both groups have relentlessly teased audiences with the track in their live sets. Following the 2017 release of Delta Heavy’s remix of Zeds Dead’s “Lights Out”, the pairing between the two acts should come as no surprise to fans of either party. Both are widely revered for their ability to craft and create monstrous yet elegant productions; both actively look to transcend the limits of genres with their music, drawing on elements of hip-hop, rock, indie, even punk as heard Delta Heavy’s previous single ‘Anarchy’. The two acts spoke about the single and the process of working together. ‘Lift You Up’ follows on from Delta Heavy’s announcement earlier this month of their forthcoming studio album ‘Only In Dreams’, set for global release this spring on Ram Records. The UK duo, who have been producing together since 2008, have refused to be constrained by genre limitations, resulting in a plethora of celebrated productions including ‘Ghost’, ‘Get By’ and their massive debut album ‘Paradise Lost’, which spawned the 18 million+ streaming monster ‘White Flag’. With ‘Lift You Up’ coming hot on the heels of ‘Anarchy’ and with ‘Only In Dreams’ now just a matter of months away, the pair also gift fans a run of major tour dates that includes a key gig at London’s Oval Space in front of home fans. Zeds Dead are one of the top EDM artists today. Their consistent stream of quality releases has won them the adoration of millions of fans and praise from the biggest names in music. Following the release of their long awaited debut album in 2016, Zeds Dead have continued to surprise old fans and gain new ones with a series of collaborations with Illenium, Ganja White Night, Jauz, 1000volts (Redman & Jayceeoh), and Snails. The new track comes right at the culmination of Zeds Dead’s 2nd Annual Deadbeats North American and European tour which wrapped up at the end of 2018 in Brooklyn, NY, and just as they’ve announced their 6th Annual DEADROCKS event at Red Rocks Amphitheatre set for July 2nd & 3rd 2019. As the brainchild of Zeds Dead, Deadbeats label recently released singles from Devault, DNMO, GG Magree, Hunter Siegel, an EP from 1788-L, the 3rd volume of the semi-annual WE AREA DEADBEATS compilation, and a critically lauded debut album from Shades entitled “In Praise of Darkness”. Forthcoming Deadbeats releases include 1000volts, Rusko, 1788-L, Peekaboo, and more.